This press tour will cover the preparations underway to be a venue for Rugby World Cup 2019, speaking with the mayor and visiting a local elementary school and the stadium that the rugby matches will be played at. The tour will also cover regional disaster preparedness for tsunami in particular looking at; seawalls; evacuation towers; inochi-yama (“life mountain,” evacuation sites with artificially raised land), and a tsunami evacuation drill carried out by preschoolers. Four matches will be played in Fukuroi, from the Japan vs. Ireland match on September 28 to Australia vs. Georgia on October 11. 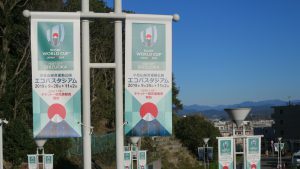 Preparations have been proceeding at Shizuoka Stadium ECOPA where the matches will be played, to be able to accept 200,000 tourists over the course of the World Cup. The occasion is also providing an opportunity for the internationalization of residents, such as improving the English skills of local children. Located in the west of Shizuoka Prefecture, on the Pacific coast, Fukuroi has been hit repeatedly by disasters including major earthquakes and storm surges. 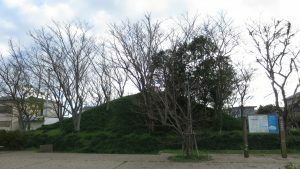 There is an artificial mound in the city, an inochi-yama, used as an evacuation site from tsunami since the Edo period. 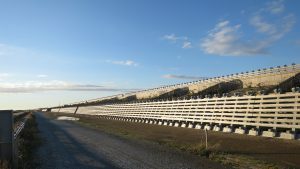 Since the Great East Japan Earthquake, as greater disaster preparedness is sought after, the city has built modern inochi-yama, taking unique precautions against tsunami using the lessons of their ancestors. With the motto of becoming “the healthiest city in Japan,” Fukuroi has been putting efforts into food education at school cafeterias. 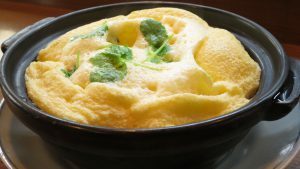 There is a focus on local consumption, using locally-grown ingredients for many of the menu items. *This press tour is sponsored by Fukuroi City, with planning and operation assistance by the FPCJ. One of the venues for the 2019 Rugby World Cup, Fukuroi, located in the west of Shizuoka Prefecture, is a city with a population of around 88,000. With its support for raising children and efforts to bring in companies, the population of the town is gradually increasing, and with an average age of 43.9 (according to the 2015 national census) it is one of only a few “young cities” in the prefecture. 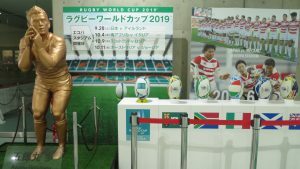 It was also a venue for the soccer 2002 FIFA World Cup hosted jointly by Japan and South Korea, and the infrastructure from that time, such as the stadium and roads, are being put to use in preparations for this year’s Rugby World Cup. The city has also been working on internationalization, particularly of the children who will support its future, and has been encouraging homestay programs for foreign tourists at local households and English education for elementary and junior high school students. ◆The tour will speak with the mayor about the city’s policies in preparation for Rugby World Cup 2019. 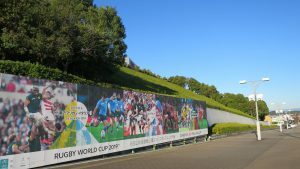 There will be 12 venues throughout Japan for the Rugby World Cup, and Shizuoka Stadium ECOPA will be the site of four matches, including Japan vs. Ireland. 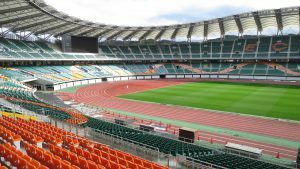 This stadium was used for the 2002 FIFA World Cup hosted jointly by Japan and South Korea, and with a capacity of 50,889 people it is the second-largest rugby venue in Japan. The stadium’s sound system and monitors have been renovated, and currently seating and lighting appropriate to high-definition video are being installed as preparations for the Rugby World Cup near completion. 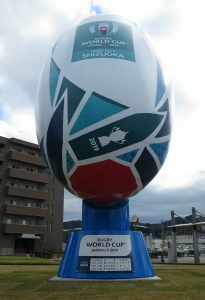 ◆The tour will visit Shizuoka Stadium ECOPA and hear from management about the renovations made for the Rugby World Cup, preparations to accept the influx of visitors, and hopes in hosting the competition. 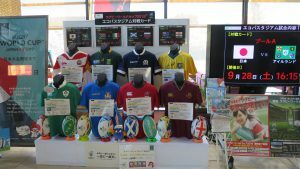 The tour will also be able to film and photograph the stadium seating, camera booth, and locker room, and at the nearby Aino Station, the largest rugby ball monument in Japan. 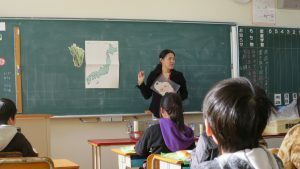 With many foreign tourists expected to visit Fukuroi due to the 2019 Rugby World Cup, special efforts have been made to improve the English skills of local children so they might develop into “people able to provide hospitality in English.” The foundation for this is early English education in the lower grades of elementary school. Fukuroi implemented the new curriculum that will be implemented nationwide in 2020 early, with all schools in the city using it from 2018. English-language activities for speaking and listening which previously started in Grades 5 and 6 now start in Grade 3, and in the higher grades English is taught as a subject, including reading and writing. 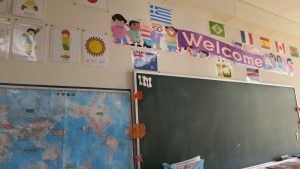 Native English speaker ALTs (assistant language teachers) help teach all the English classes in Grades 3 and over, as part of efforts to develop useful English skills through practical lessons. ◆The tour will visit Konan Elementary School, a municipal school which participated in curriculum development as a “model school for advancing English education.” The tour will hear about the unique characteristics of English education in Fukuroi from a staff member of the Fukuroi Municipal Board of Education, and have the opportunity to observe a Grade 5 English class. The students will also speak about their hopes for hosting Rugby World Cup 2019. 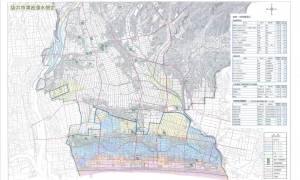 The Earthquake Research Committee, part of a national governmental organization, predicts there is a 70–80% chance of a magnitude 9 Nankai Trough earthquake occurring within the next 30 years. Fukuroi is one of the 139 municipalities which is considered at particular risk from the tsunami such an earthquake would cause, and has experienced major disasters in the past such as the magnitude 8.4 Hoei earthquake in 1707 and the 1944 Tonankai earthquake. 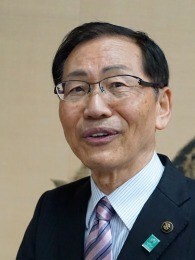 According to estimates by the national government and Shizuoka Prefecture, if a major Nankai Trough earthquake occurs, there could be major damage to Fukuroi, with up to 600 dead and 15,000 buildings destroyed. Living with the ever-present danger of earthquakes and tsunami, disaster awareness in Fukuroi is very high, and since the Great East Japan Earthquake, even worse disasters were taken into consideration. With new sea walls built and more tsunami evacuation sites built, and evacuation training being carried out by whole communities, Fukuroi has some of the most thorough tsunami countermeasures in Japan. ◆The tour will receive a briefing on Fukuroi’s tsunami countermeasures from a member of the city’s Risk Management Section, and visit a seawall, a tsunami evacuation tower, and both Edo-period and modern inochi-yama. Inochi-yama are artificial mounds built during the Edo period to serve as evacuation sites in case of tsunami. In 1680, one of the largest typhoons of the Edo period hit Japan, and around 300 people are said to have died in Fukuroi due to storm surges. In order to prevent this tragedy from happening again, the villagers at the time built a large mound to save the lives of residents from future storm surges. Since the Great East Japan Earthquake, as debates have been carried out over what kind of evacuation facilities should be used to protect lives from tsunami, Fukuroi residents began calling for building a new inochi-yama based on the one built in the Edo period. 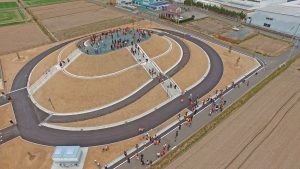 Inochi-yama cost less to maintain than evacuation towers and are semi-permanent, and can also be used as a walking course or as a location for community events. The City of Fukuroi created a tsunami evacuation plan and built four inochi-yama to protect the lives of residents. Based on Fukuroi’s example, other cities which are predicted to be in damage from tsunami, such as Hamamatsu and Kosai, have also been building inochi-yama. ◆After visiting an Edo-period inochi-yama, which have been designated as cultural artifacts by Shizuoka Prefecture, the tour will visit Minato Inochi-yama the first of the four modern inochi-yama to be built in Fukuroi and the largest with a capacity of 1,300 people, and hear about the benefits of inochi-yama. Kirarin Tower is the first tsunami evacuation tower built in Fukuroi, with a height of 12 meters above sea level and space for 270 people to evacuate. 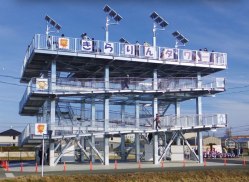 With daycares, a preschool and an elementary school nearby, a temporary evacuation site for the area had been considered necessary, and after the Great East Japan Earthquake the city worked to improve the tsunami evacuation plans for the area, and completed construction of the tower in 2012. 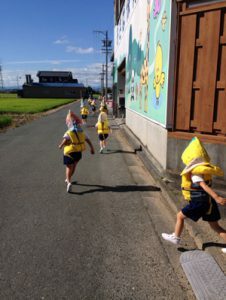 The neighboring preschool carries out evacuation drills almost every week. 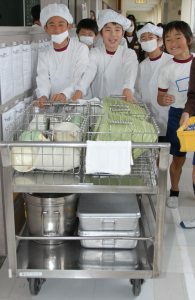 ◆The tour will be able to see the children from the neighboring preschool carrying out their tsunami evacuation drill. The Asaba Coast, 5.35 kilometers long, was beloved by locals for its beautiful scenery of white sand beaches and pine trees planted as a coastal barrier. However, in recent years, pine wilt and other issues weakened the pine trees. With tsunami of up to 10 meters predicted to hit the Asaba Coast in the case of a major Nankai Trough earthquake, and large-scale flooding predicted for the coastal region, in 2014 the City of Fukuroi and Shizuoka Prefecture worked together to begin building an embankment to reinforce the coastal barrier forest and help prevent tsunami damage. ◆The tour will visit part of the coast where construction has been completed, and see the finished 12-meter-high embankment and newly planted coastal barrier forest. There will be a briefing about the Fukuroi-Shizuoka Model Seawall Project, with the goal of using coastal areas and having people live in harmony with nature, while protecting their lives and homes from tsunami using seawalls. Katsuragi Hotel Kitanomaru is Fukuroi’s most famous resort hotel, made by moving and rebuilding kominka (traditional Japanese houses) original built 200 years ago. 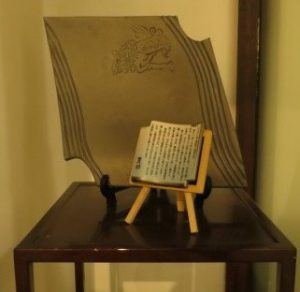 In the 1970s, the chairman of the Yamaha Group at the time learned that the wooden kominka of the Hokuriku region were being forgotten and falling into disrepair, and suggested using them for a hotel. Seven of these kominka were moved to Fukuroi, and construction finished in 1978. Katsuragi Hotel Kitanomaru is also famous for Philippe Troussier, the Japanese team’s World Cup soccer coach for the 2002 FIFA World Cup hosted jointly by Japan and South Korea, having called it “a place where samurai can rest both physically and mentally,” and choosing this location for a training camp. 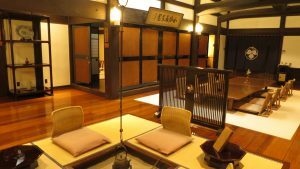 Built in the style of a Japanese castle, valuable wood which could only be obtained because of Yamaha being a major musical instrument manufacturer is used throughout the hotel, and the unique joinery of the kominka not using nails was also left as-is, making the hotel’s construction very unique. 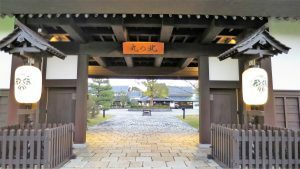 The entrance is a nagayamon, traditional for the houses of samurai in the region, and the roofs use local Enshu tiles, adding local touches to the traditional Japanese architecture. 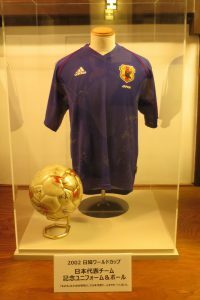 ◆The tour will visit Katsuragi Hotel Kitanomaru and hear from Yamaha Resort President Mr. Sadatoshi Ando about its unique features and his hopes for being chosen as a venue for Rugby World Cup 2019, as well as being able to film and photograph the buildings. The City of Fukuroi has been working on encouraging increased consumption of vegetables and using local products to encourage the development of healthy eating habits and to stimulate the local economy. The city’s Delicious School Lunch Division has been promoting the use of local products in school lunches. At the 8th Alliance for Healthy Cities Global Conference held in Malaysia in 2018, Fukuroi received a WHO (World Health Organization) Healthy Cities Best Practice award in recognition of its efforts, which are receiving attention from around the world. By working to collaborate with local producers and build a logistics system joining school lunch distribution centers and local districts, the ratio of local products being consumed in school lunches for 10 major products that have a steady supply year-round, such as bok choy and cabbage, increased up to 31.8% in the 2017 fiscal year. ◆The tour will receive a briefing from a member of the city’s Delicious School Lunch Division about the City of Fukuroi’s efforts in collaboration with local producers and schools to make school lunches using local products, as well as visiting a school and a farm. A key part of the food education in Fukuroi is periodic visits to schools to teach children by nutrition educators and others. Nutrition educators will go around the classroom during lunch, teaching students about what ingredients in the lunch are in season and where they are produced, adjusting the content depending on the time of year and the grade. Food education also involves teaching gratitude to the producers and cooks, and how best to serve food. ◆At an elementary school, the tour will be able to see school lunch being served, from when the delivery truck arrives at the school until the students whose job it is that day serve lunch in the classroom. The nutrition educator will explain about the food, and the tour participants will eat together with the students, followed by interviews with the students. 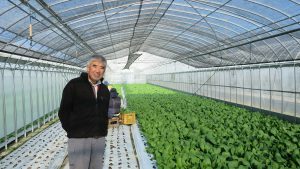 “Having the local children eat the vegetables I grew is one reason my job feels worthwhile,” according to Mr. Toshiyuki Suzuki, who has been providing bok choy as ingredients for school lunches for the past eight years. With six greenhouses in 1500 square meters of land, about 15% of the bok choy grown is provided for school lunches. Elementary school students also visit the farm to experience harvesting bok choy, which Mr. Suzuki hopes will make the children more familiar with how vegetables are grown, and pique their interest in local Fukuroi ingredients. ◆Mr. Suzuki will speak about how to grow safe, delicious vegetables, and his thoughts as a producer on participating in the food education of children. Cost: 10,000 yen per person including transportation, accommodation (breakfast included), lunches for Day 1 and 2 and dinner for Day 1. *If the number of applicants exceeds 9, an upper limit may be set on the number of participants from each country/region. (1) The schedule is subject to change without notice. (2) This press tour will require participants to bear part of the cost, but is not a profit-making venture. (3) Neither Fukuroi City nor FPCJ will be liable for any inconvenience, trouble or accidents that might occur during the tour. (4) There may be some restrictions on photographing and filming at the tour sites. Please follow the instructions of the staff in charge. (5) This press tour is intended to provide opportunities for news coverage. We request that all participants send a copy of the content of their coverage (article, video, or audio in the case of radio) to Fukuroi City through the FPCJ after their reports are published or aired. When your report is in a language other than English or Japanese, we also ask you provide a summary in English or Japanese. With receiving your application, we assume that you agree to these conditions.